The Story: A white-banded cleaner shrimp hopped into the mouth of a grouper to have some leftover food. While at the same time, the grouper has its mouth cleaned by the shrimp. This cleaning behavior ensures both species mutually benefit from this symbiotic relationship. I am fascinated by this behaviorbetween the grouper and the shrimp. 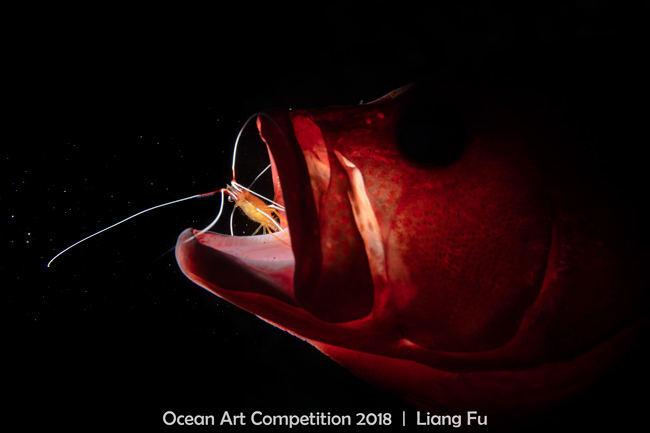 To capture this moment, I tried to use a snoot with side-back lighting to create a strong shadow of the body of the grouper while at the same time lighting up the mouth. Lucky enough when a shrimp jumped just on the edge of the mouth, I got the photo that I was hoping for.